In 5-quart Dutch oven, melt butter over medium-high heat. Add chicken; cook 6 to 8 minutes, turning once, until chicken is no longer pink in center. Using slotted spoon, transfer to bowl; cover and keep warm. Add bell pepper, green onion whites, pepper and salt to butter and drippings in pan; cook over medium-high heat 3 to 5 minutes, stirring frequently, until softened. Stir in broth and whipping cream; heat to boiling. Stir in pasta; return to boiling. Reduce heat; simmer uncovered 12 minutes, stirring frequently. 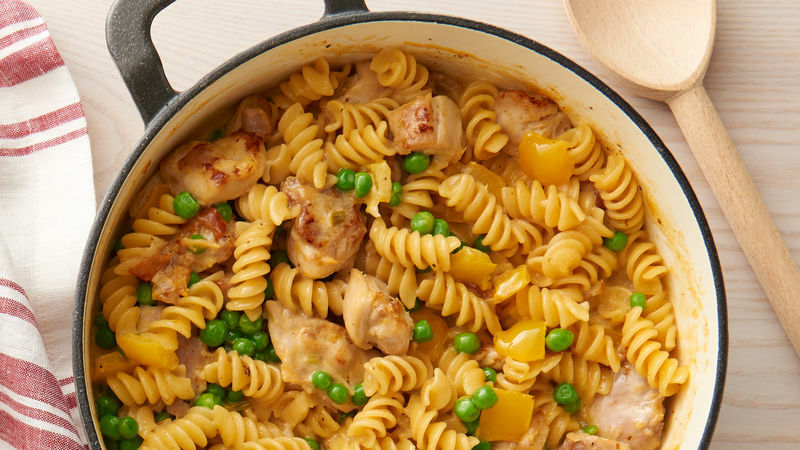 Stir in frozen peas and chicken; stir 3 to 4 minutes or until pasta is cooked to desired tenderness and sauce is thickened. Remove from heat; stir in cheese until melted and smooth. Top with green onion greens. Smaller pasta shapes generally perform best in one-pot pastas. Be sure to taste the pasta before serving to make sure it’s tender. Chicken thighs stay tender even with long cooking. Chicken breasts would dry out in this recipe.